Square balusters and a smooth Oak stringer along the outside of this wooden spiral staircase adds an elegant, uniform look to this contemporary setting. 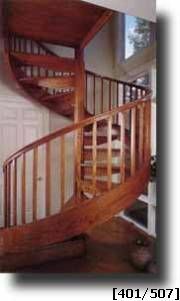 Because of this wooden spiral staricase’s smooth, continuous stringer, the stair had to be shipped in one large section. The stair was carefully crated whole and shipped to the customer, who made the necessary accommodations to the facility to ensure the entire stair could be rolled inside.